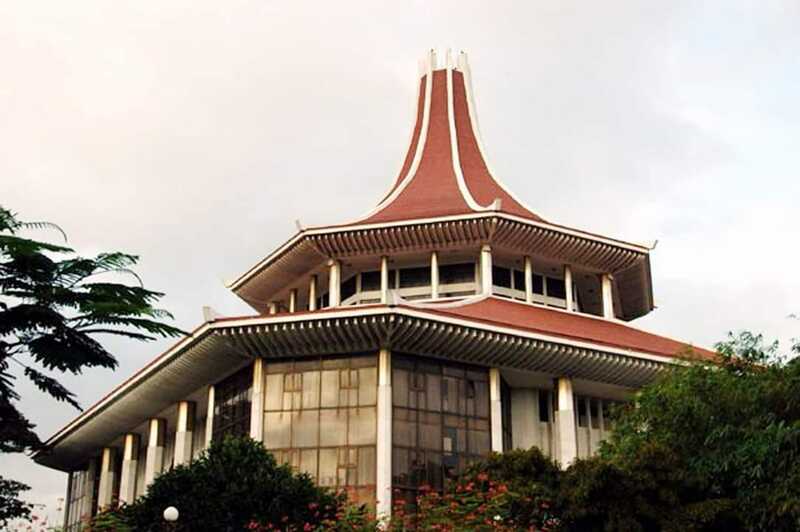 (Lanka e News - 12.Nov.2018, 11.00PM) Summary of submissions and hearing which took place today in the Supreme Court of Sri Lanka with regard to the alleged dissolving of the Parliament. FR Petitions on dissolution just being taken up by court. AGs dept saying that notice has not yet been served on all parties. Presidents Counsel K. Kanag-Isvaran asking court to take this matter up today due to grave urgency. Bench consisting of CJ, Priyantha Jayawardena J and Prasanna Jaywardena J will take the matter up at 2pm. Several senior counsel expected to make submissions. Many seeking to intervene in the application as well. Presidents Counsel K. Kanag-Isvaran commences his submissions in SCFR 351/18 for Leader of Opp @R_Sampanthan. States that a proclamation cannot be made under Art. 70(5). It is only a consequential provision. Has to be under 70(1) which President has not done. He further explains that Article 33(2)(c) is only an empowerment and not a stand alone provision. There are other provisions in the Constitution that legitimately influence its meaning and ambit and they need to be followed. Counsel Hejaz Hizbullah for 4th Respondent in same case (Prof. S.R.H Hoole - member of election commission) says that it is his duty as a member of the EC to uphold the law. Legal precedent requires him to seek legal recourse. Says the proclamation is ex facie bad in law. Former AG Tilak Marapana commences submissions in SCFR 352/18. Says that EVEN IF 33(2) was a stand alone provision, the act of dissolution has to be done reasonably and NOT for a collateral purpose as @MaithripalaS has done since the 26th October. Counsel @ViranCorea commences submissions in SCFR 353/18 for Centre of Policy Alternatives and @PSaravanamuttu. Says that the Right to Franchise of Voters of Sri Lanka are affected by this act, and asks for a stay order against the proclamation. Dr. Jayampathy Wickremaratne PC in SCFR 354/18 explains the rules of Constitutional Interpretation. Must look at the intention of the framers of the law, and interpret the law harmoniously. Should not interpret 33(2)(c) in a way that conflicts with 70(1). Counsel @MASumanthiran in SCFR 355/18 explains the separation of power; under our Constitution each organ of government is supreme in its own sphere. There are checks and balances between them, but one cannot extinguish the other in this manner. He says that the act of Dissolution is void ab initio. Therefore anything that arises out of it, such as the General Election in the Proclamation are illegal. Mr Sumanthiran PC also points out that if 33(2)(c) was a stand alone provision the President could prorogue parliament indefinitely without abiding by the limitations in Article 70. He explains how reading 33(2)(c) this way could lead to major abuse of power. After short adjournment court takes up SCFR 356/18. Mr. JC Weliamuna PC states that 19th Amendment increased the powers of Parliament, which has a direct mandate of the people. Reminds us that Lawyers take an oath to defend the Constitution at a time when sun is setting on it. Mr Weliamua also says that the position isn't that Parliament cannot be dissolved before its term. It can, but the procedure needs to be followed, i.e. reconvening Parliament and getting the approval of 2/3 of members. Presidents Counsel G. Alagaratnam in SCFR 358/18 says an Article of the Constitution cannot be read in isolation or in a manner that creates an absurdity. This would be the case if the President can dissolve Parliament the day after it is elected. He also points out the impact that this act of the President has had on the economy and the country as a whole. Mr. Suren Fernando in SCFR 359/18 explains that Article 70(7) re calling a dissolved Parliament in an emergency only applies if there is a valid dissolution. Without such dissolution, Parliament can reconvene. Presidents Counsel Ikram Mohamed appearing for @Rauff_Hakeem and others in SCFR 360/18 reminds court of Article 33(1)(a) which says the President is duty bound to ensure that the Constitution is respected and upheld. Much awaited Petition (SCFR 361/18) of Memeber of Elections Commission Prof. Hoole taken up. Counsel Hejaaz Hizbullah asks how Article 70(5) mentioned in Proclamation can stand alone in disregard of 70(1). He also says that the right to Franchise isn't only about holding elections but also respecting the choices of the people made in elections. He asks for a stay order pending the final determination of this case because of the large cost of Elections. Court adjourned till 10 AM tomorrow following AG's request for more time to make his submission.